Android 5.1.1 Lollipop is now finally available for YU Yureka . The new update will Install Cyanogenmod OS 12.1 on your Yureka Smartphone . The update is rolling out in phases and will be available to every Yureka users soon . Although Users can manually update Yureka to Android 5.1.1 , the update zip is available to download , and users can install it without rooting , or unlocking bootloader . Can i update if i rooted my device ,if yes then how?? Just flash the update zip via stock recovery ! It needs Stock recovery ! You might end with a bricked phone ! No , Root is not required ! When ota update will come ? my yureka plus is not rooted well i tried all the process on internet as well tell me the solution!! how do we flash this ROM with TWRP recovery? what is the changelog in this update 5.1.1...i already updated i see only dpi option is there! anything else there? how to flash using twrp ? I think you need to google it ! Cyanogen os means which the company officially provides to the smartphone they have joint ventured ! 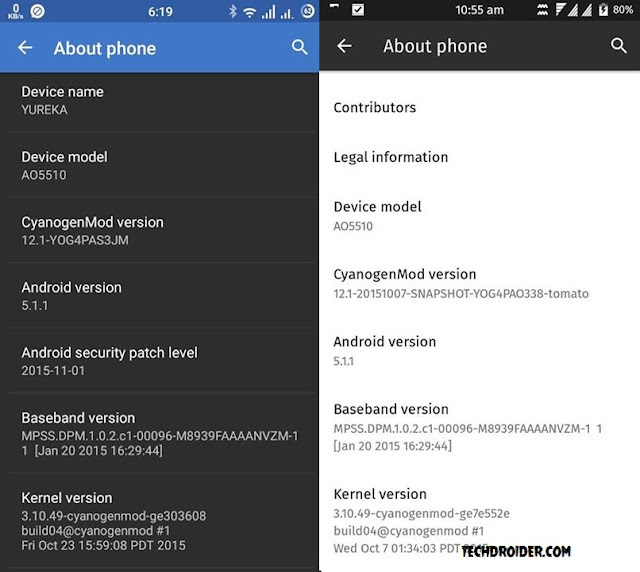 And Cyanogenmod is what the developers makes or ports ! Only the name is different , but the stuff is same ..
Don't comment unnecessary ! Huh ! Just one question, 120 fps is there or not in yureka. It is there in yureka plus. I have downloaded the update but it is not in about phone 5.1.it is still 5.02.what will i do to get the phone updated?? Like some users, I too see 5.0.2 in About- Phone after installing 5.1 update via otg. Any idea? ?